3RW arkitekter’s investigations for the Norwegian Defence Estates Agency (NDEA) seek to provide new kinds of evidence for the safe management of former military sites across the country. 3RW arkitekter engages in a process of landscape healing by using advanced technology and research to construct knowledge about these areas and restore them for future uses. When completed, this national project will constitute one of the biggest environmental restoration initiatives in Norway, and will ensure new and safe use of more than 20.000 hectares of Norwegian nature. As part of a massive effort to make the defence sector in Norway more efficient when it comes to the real estate portfolio from early 2000, 3RW arkitekter was commissioned by the Norwegian Defence Estates Agency (NDEA) to participate in the making of a national plan aiming at reducing the number of training facilities and firing ranges. The plan was delivered in 2004 and it recommended to concentrate the training activity to a limited part of the facilities available, and to terminate the remaining areas. In 2005, the Ministry of Defence commissioned the NDEA to make another study, this time highlighting what measures would need to be taken to clean up these areas and hand them back to their original owners, or sell them in those cases where they were owned by the government. The NDEA commissioned 3RW arkitekter to conduct the study, and in 2007 the first report was delivered. This report gave an overview of the necessary measures to clean up 27 different locations spread across the entire country. Each of the properties were visited and subject to extensive field work, including surveying and documenting the sites, and carrying out environmental analysis and safety assessments. 3RW arkitekter also carried out extensive research and analysis of the history and nature of the sites, as well as coordinating all the specialized resources for testing the environment. Many of the areas that analysed had been out of use for a long time, and vegetation and erosion often covered the physical indications of the site’s former activity. In addition to this, there was in general a lack of documentation available that fully disclosed which were the training procedures that had been conducted in the areas. Our work thus became a sort of forensic investigation. Tedious studies were conducted, going through and combining bits and pieces of historical documentation, and tracking down and interviewing former military personnel who helped reconstructing the types of military training conducted in the different areas. We then constructed hypotheses defining the types of activities and facilities that had once been in those areas, and verified them with results from the fieldwork. As an example, we could search parts of the areas visually and with metal detectors, and find small pieces of shrapnel that were analysed, verifying the use of specific weapon systems. The results could then provide vital information of ranges that were used, of other possible target areas, and whether the weapon systems posed a risk to unexploded ordnances (UXOs) left in the field. In the end, we were able to produce fairly accurate maps with the different types of facilities that had been in operation. Based on these maps, test plans for pollution could be made and led to more detailed plans for the actual measures that had to be executed in order to clean up the areas. Based on this analysis, the areas were classified into two different categories: areas that only contained pollution and structures that needed to be removed or secured, and areas that also contained risks of UXOs. This distinction was crucial, because in the areas with risks of UXOs, no measures for pollution cleansing could be done without further investigations and careful risk assessments coordinated by military specialists. After that process, 3RW arkitekter were commissioned to assist in the more detailed planning of the actual clean-up and restoration of the areas that did not contain risk of UXOs, and in 2009 about 95 MNOK of governmental funding were granted to start this work. That same year, work on the first three areas started: Tisleidalen in the eastern part of Norway, Rinnleiret and Midtsandan in the mid-region of Norway. Today, most of the areas (13 of them) included in this plan are cleaned up, secured, revegetated and part of the Norwegian landscape, accessible for all. By the end of 2017, only one of them won’t be fully completed. In 2010, 3RW arkitekter were commissioned by the NDEA to prepare more detailed plans for the cleansing of 10 former training areas that all had risks of UXOs. 4 of these had not been surveyed and analysed yet, and 6 of them belonged to the group that 3RW analysed back in 2005-2007. 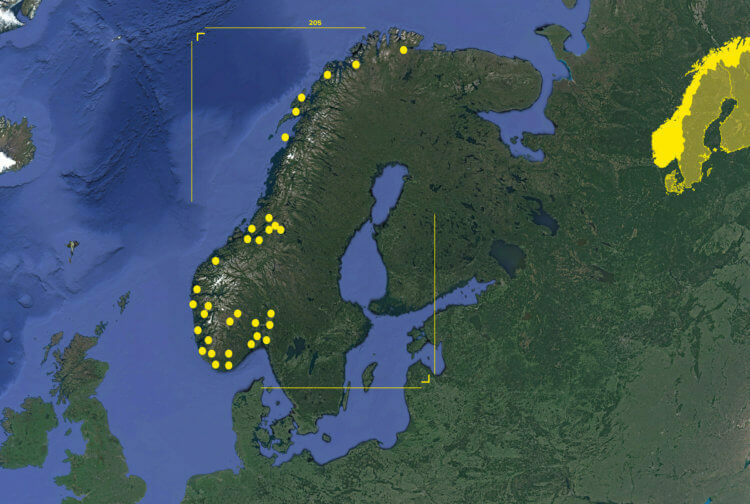 All the fieldwork was finished in 2012, the report was delivered, and measures at an approximate cost of 192 MNOK had been identified in order to safely clean up the areas. In 2013, the government fully funded the work and gave the order to conduct the clean-up in accordance to the report. The special aspect of this group of training areas was how to handle the recommended clean-up procedures in a way that did not pose a risk to the workers due to the UXOs. The suggested way to do this includes a combination of manual searching, the use of specially trained dogs that can identify explosives, as well as the use of remote operated construction machines (excavators, trucks, etc.). These are time-consuming and expensive methods, but they are necessary to mitigate the risk of accidents during the work. In the same year as funding confirmation, work started on the first areas, Avgrunnsdalen in the eastern part of Norway, and Gimlemoen in the southern part of Norway. From 2014, the search for UXOs with specially trained dogs was conducted in many of the former training areas to prepare for the coming phases with more intense work in the field. Today, many of the training areas that 3RW arkitekter planned in 2010-2012 are either finished or in process in the field. By the end of 2017, about half of the areas from this plan will be completed. The NDEA has recently started the planning phase for the last remaining areas. These 10 former training areas have all been surveyed and analysed by 3RW arkitekter in 2005-2007 and 2010-2012. The NDEA expects that the documentation for funding will be ready by the end of 2017, and that work will be able to start up on these last areas in 2018. The armed forces are by far the largest real estate operator in Norway, and have been for a long time. After the end of the cold war, there was a constant ambition to reduce the amount of buildings and facilities, but it was very hard to reach this objective. Over time, an imbalance between the size of armed forces and the budget they were granted by government, started to become very clear. Just before the millennium change, a series of highly important studies were conducted: that would be the start of the biggest turnaround process in the public sector in Norway. In 1999, a committee dedicated to investigate the defence-political aspects of the country was appointed by the Norwegian parliament. Their report “NOU 2000: 20 Et Nytt Forsvar, Forsvarspolitisk utvalg, 2000” highlighted that despite the benefits of distributing military infrastructure across the country, the need to concentrate military facilities in a smaller footprint was clear. The figure below is from the report and shows what influence the defence sector had on the total job-market in the country. Especially in the north and central eastern parts of Norway, a significant portion of all jobs was related to the defence sector. This again produced local “backbones” for many communities, and it was clear that any adjustment in the military footprint would potentially have huge effects on many of these areas. At the point the committee delivered their report, the Defence Sector’s real estate portfolio consisted of some 28.000 buildings that measured in total more than 6 million square metres. The armed forces had facilities in more than 400 of the total 435 municipalities in Norway at the time. The management and maintenance of this portfolio alone employed 2.300 persons, most civilians, to a total cost of 3,5-4 billion NOK each year. In addition to all these buildings, the portfolio also included 1,4 million decares of land used for different purposes. A significant part of this were military training areas distributed throughout the country in the same way that other military infrastructure were. Each military camp and facility had normally one or more training areas nearby to enable efficient combat training. Any strategy involving a concentration of the military footprint would therefore also involve new discussions on the need for many of these training areas. Parallel to the committee report, the armed forces made their own study in the end of the 1990s. In the introduction of the final report from this study, the chief of the armed forces pointed out that the study had not been carried out to show what kind of military force Norway needed, but rather what they could get given the resources available. This also highlighted the severe imbalance between the level of ambition and the budgets granted that in a way had turned the armed forces into a self-destructing dinosaur, unable to do what it was supposed to. A change had to be done, and the military study concurred with the defence-political committee in the need for a radical concentration of the military footprint. The old military that had been based on “meatweight” and quantity, would now be reshaped to a much smaller, highly mobile and specialized capacity. In order to do this, a lot of new infrastructure had to be created, new vessels, vehicles, aircrafts and weapon systems had to be purchased, and the need for resources would be very high over a long period of time. To enable the turnaround, there had to be a major reduction in people working in the armed forces and in the costly buildings and facilities all across the country. In the beginning of the new millennium, the government issued a proposal to the parliament that would ensure the implementation of the massive changes needed in the defence sector. The first paragraph in the document translates to something like this: “The Norwegian armed forces are in a state of deep and ongoing structural crisis”. The document “St. Prp. Nr. 45 (2000-2001) Omleggingen av Forsvaret I perioden 2002-2005”,set a goal to reduce the real estate portfolio by 2 million square metres from 6 to 4 million. In addition to this, some 5000 jobs in the defence sector were to be cut. The turnaround should be implemented over a period of 4 years, although everyone was well aware that many of the needed transformations would take much longer time to carry out. The proposal document, based on the military study and the defence-political committees report, was very clear on some specific camps and facilities that had to be closed down. But this was only a fraction of the goal of a reduction of 2 million square metres. In the aftermath of these political processes, a whole range of strategic planning processes were set into action, and a hunt for all possibility of reduction started. This started a long period of focus on efficiency in buildings, multifunctional typologies, shared facilities and so on. It was quickly discovered that in order to get results, whole camps and compounds needed to be closed down. The government had launched anticipation that military facilities that were no longer needed in the new, more concentrated structure should be sold, and the profits should be channeled back into the further modernization of the armed forces. Today, the turnaround process has been a success. A special branch formed within the NDEA had by 2012 sold 2,6 million square metres of military buildings, gaining profits in the amount of 3,5 billion NOK. The reduction in the portfolio secured some 400 million NOK in reduced cost for maintenance and management every year. The rearrangement of the real estate portfolio has played a crucial role in the transformation of the defence sector. The development of the former military camp Bømoen at Voss into a sustainable community, is a direct example of the aftermath of this process. The camp was shut down in 2008 and, since 2010, 3RW arkitekter have been involved in the reconfiguration of the 2 square kilometer property for civilian purposes. The architectural team was first involved as an advisor to the NDEA on what potential the property had, as a foundation for pricing and sale of the property; and then as a planner for the private buyers of the property, who aim to develop the area with housing, schools, business, industry and vast recreational areas. The more than 15-year long series of commissions for the NDEA regarding how to rearrange the portfolio of military firing ranges, including building new, more compact and environmental facilities, identifying the ones that no longer are needed, and planning the cleansing and restoration of nature in these areas, are another example of tasks emerging from the turnaround process in the Norwegian defence sector. An example of this is Ulven Shooting Range.